We’ve made it to week 4! This update is going to be short and sweet because progress has been made but let’s face it, this is not the most interesting phase of the project. The marble floor tile is in and I’m really happy with the choice. It feels luxurious and reflects a lot of light which already changes the feeling of the place. Next, and this is a big one for me, THE WALLS! All of the texture and old wallpaper was removed. We now have perfectly smooth walls prepped for wallpaper. I love, love, love this change. Even without the wallpaper, things are looking much less ragged. The electrical work has been completed as well. We added a recessed light over the tub which should make a huge difference for nighttime showering. As for vanity lighting, we are using pendant lights hung from the ceiling; something I’m slightly nervous about, but more on that later. 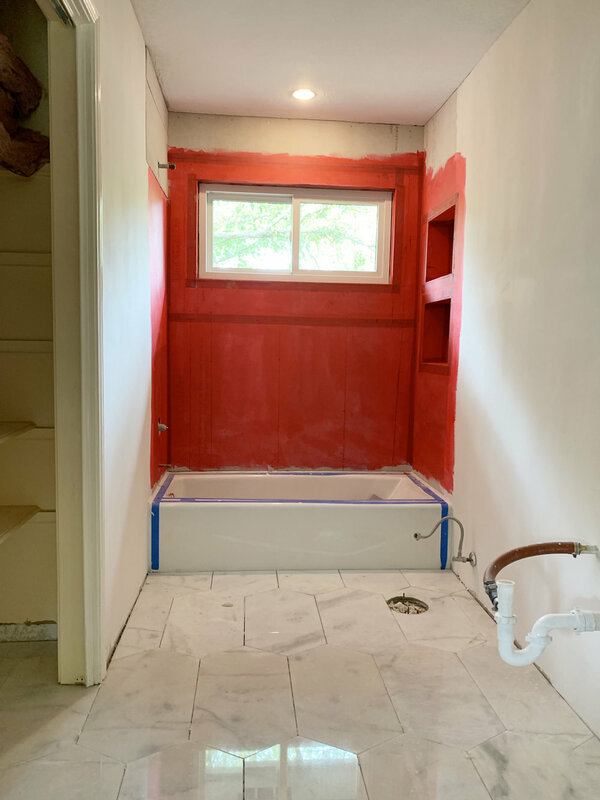 The red sealer on the shower cement board is jarring, but maybe it got your attention. 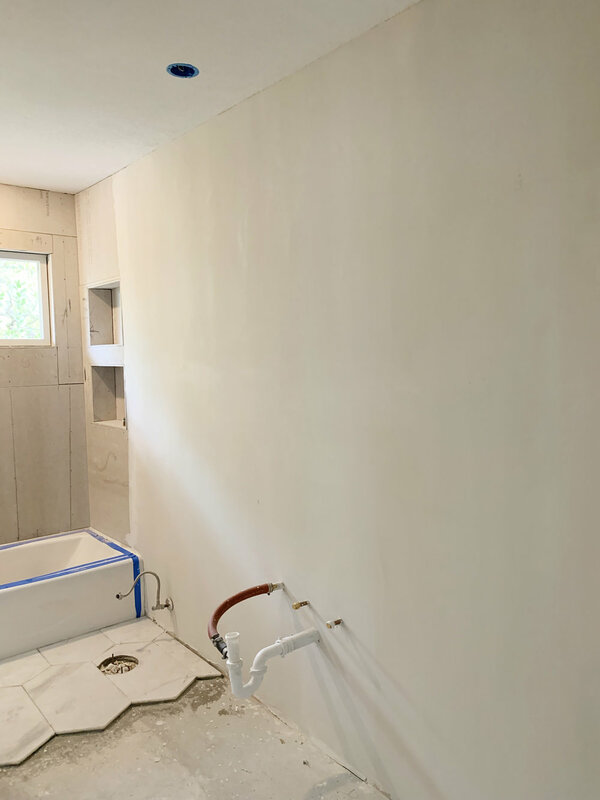 Sealed cement board means wall tile is ready to go up. We’re entering the home stretch! Come back next week for a bathroom that will look more like a bathroom, and might even have a toilet in it. Check out the One Room Challenge Blog to see what the other participants are up to. Here we are at week three of our girl’s bathroom renovation and I’m happy to say things are moving right along. After demo, the bathroom has been built back up starting with new backer board. Two niches have been created in the shower. Next came the biggest challenge of this project; leveling the floor. As I mentioned in my first post, it’s possible that the house was built this way ( somebody’s measuring mistake?) None of our other upstairs rooms have this problem. I was curious to see how the leveling would be done, because we were dealing with about 3/4 inch difference between the left side of the room and the right side. 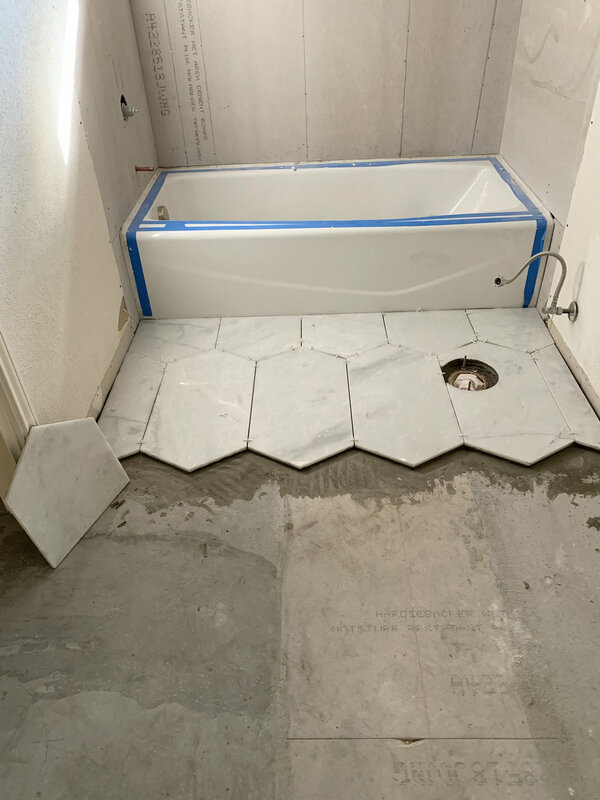 Our contractor put a sheet of cement board down on the sub floor, then smoothed self leveling floor compound and careful leveled everything. So now the floor is ready for tile! I splurged on oblong marble hexagon tile that mimics the picket tile in our kitchen backsplash. We drew out the tile pattern and are ready to go. These are my top four wallpaper choices. Each paper picks up the deep blue of the vanity I chose, and each brings in a shade of peach/salmon/coral that my daughter requested. Do you have a favorite? This is a tough one but I’m leaning toward Flowering Desert. In the end I think the white background will bring the airy feeling that we are looking for. Next up the old original wallpaper is being removed and the walls are being patched and prepped for the new wallpaper. Then tile the shower tile goes up. Stay tuned for the progress next week! Check week 3 updates for the other One Room Challenge participants here. Five years in to owning this house, we finally bit the bullet and did a full kitchen renovation. We did it on an extreme budget and even more extreme timeline-- finishing on December 22 with holiday guests arriving the same day. In the end we love it and wouldn't change a thing. All sources below! The best part of our existing kitchen was the windows, view, and the natural light. We didn't want to change the layout much, but wanted a light, bright space (I'm an unapologetic white kitchen lover). The color choices were easy. The original oak cabinets were not aging well and used space inefficiently. Full disclosure, I'm using the MLS photos from when we bought the house for the before photos. We'd made incremental changes along the way like painting the cabinets, etc. I love looking at the dramatic change from dark to light. We decided to remove all of the upper cabinets on the left side and install a custom range hood and simple open shelving. On the refrigerator side, we removed the double oven (see before pics below) and installed tall upper cabinets. All of the base cabinets have three drawers. I can't recommend cabinets with drawers over cabinets with shelving more. We now have fewer total cabinets but so much more storage! The cabinets are IKEA Sektion boxes with Semihandmade Super Matte Shaker doors. My ultimate favorite improvement to the kitchen is our appliance hotel. It may seem small, but having our microwave, toaster, coffee grinder and coffee maker all behind closed doors is heaven. The upper cabinets sit on top of the counter top, which added time and complication to our installation plan, but being able to just shut the door and never see all that stuff was the best decision. The new counter depth refrigerator is a big improvement design-wise but I'm not going to lie, we are still adjusting to having less space (especially freezer space). Overall, it's making us more conscious of what we buy and what we already have so I'm embracing that. I haven't missed the double oven one bit. This bathroom was long work in progress to say the least. We bought the house knowing that we'd need to remodel the master bathroom first thing (it was gross!). My husband was in a hurry to get it done, while I was dragging my feet trying to come up with the ideal design. Finally I gave in to starting the project while still not really knowing what I wanted. That's a bit of a problem. Our other problem was budget -- this is a large bathroom, over 130 square feet. That's a lot of materials and it adds up fast. We went with a classic all white design which made us both happy. At the time (this project started almost two years ago) as much as I wanted brass faucets and fixtures, they were really expensive. So on our first pass, we ended up going with satin nickel everywhere. Over time I realized that the satin nickel was a huge mistake. It all looked fine but it didn't feel like me. In fact, much of what we did with fixtures I ended up hating -- this is why you shouldn't remodel when you aren't ready and don't have the budget to do what you really want! Lesson learned. So, two years later I took another pass at this bathroom. It really needed to be warmed up and even masculinized a little. 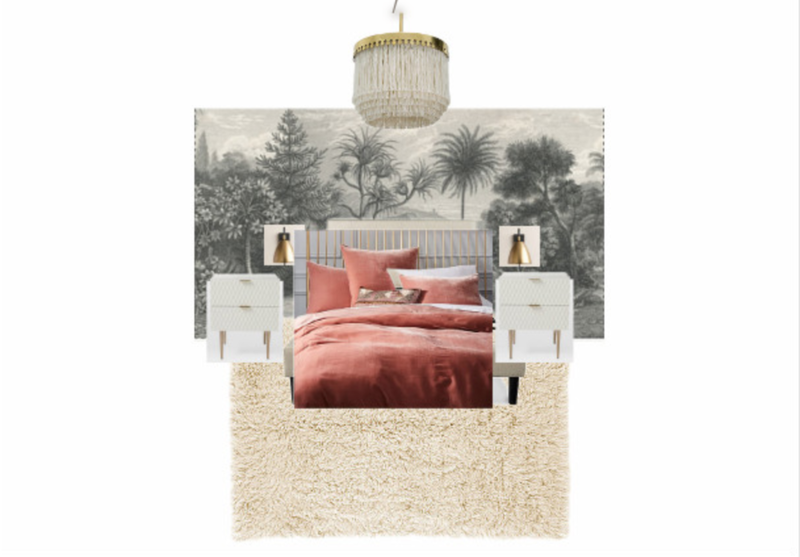 To my husband's dismay, I was ready to mix metals by adding warm antique gold tones with new mirrors and sconces. We splurged on a new solid brass urchin chandelier that I love every time I walk in. Worth it. On the bathtub side, I used two West Elm hexagon mirrors to create a version of a full length mirror that brought style and interest to the room. I added life and texture by filling the ledge above the freestanding tub with more plants. And finally, one of my own paintings for color and personality. Yes, it took two years but now this bathroom feels like mine. We'll share more photos later. For now, feast your eyes on the before photo (before photos always need to be bad don't they? ).